You may have missed it, but IO Interactive continues to update Hitman 2 with new content. April will see the release of a new Challenge Pack, an Escalation Contract, more Ghost Mode items, and the addition of Santa Fortuna to the Ghost Mode roster. There's more on the horizon though. Today, IO Interactive announced a small selection of the new additions coming to Hitman 2 stretching into Fall 2019. The highlights for the next few months start include new costumes, new proper maps, new Sniper maps, Special Assignments, weapons, costumes, and even more new themes for existing levels. Most of the content is available if players picked up either the Gold Edition of Hitman 2 or the Expansion Pass, though some of it is available to all players. Starting this Spring, Gold Edition players will get access to a new Sniper mode map, Hantu Port. Miami gets new theme for Spring Break, a Flamingo costume becomes available, and players can pick up the new El Matador weapon. All of this is in addition to the April content I listed above. 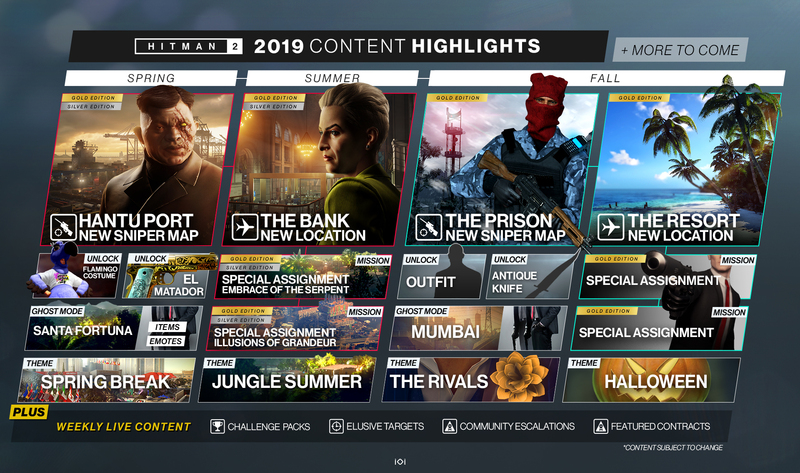 In Summer, players have access to proper Hitman 2 map in The Bank, alongside two Special Assignments in Santa Fortuna and Mumbai, and a Jungle Summer theme for Santa Fortuna. This Fall, Hitman 2 will get a new Sniper map, The Prison, and a new location, The Resort. Mumbai will be added to Ghost Mode, alongside more Special Assignments, two more themes, and another outfit. IO Interactive promises that every new location will function as expected with "new targets, challenges and mastery unlocks". The developer will be continuing its monthly updates and livestreams to keep players updated on the game's progress. The next livestream is currently planned for April 29, 2019. Tagged with Action,	IO Interactive,	News,	PC,	PlayStation 4,	Puzzle,	Warner Bros Interactive Entertainment,	Xbox One.